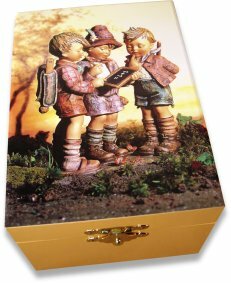 This wonderful Hummel music box is produced under licence from Goebel and has a traditional Swiss Hummel picture on the lid. Open the music box to play the tune 'Edelweiss' and reveal the velvet lined interior with mirror on the inside lid. This music box is made from a thin wood board covered in a glossy printed paper with colourful designs. The inside is velvet lined, and is fitted with a clockwork mechanism wound by a key at the back of the box.